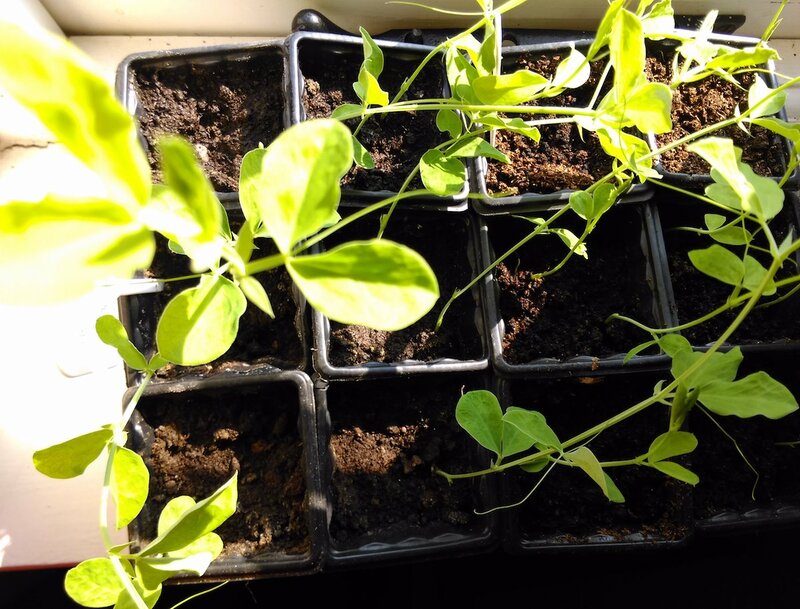 It’s been about 2.5 weeks since I sowed my Sweet Pea ‘Royal Mixed’ seeds, and about 10 days since I sowed my Sweet Pea ‘Cupani’ seeds. Out of 12 seeds of each, I have 9 Royal Mixed, and 7 Cupani that have germinated. There could be more on their way, but those early Royal Mixed are now several inches long. Sweet Pea ‘Royal Mixed’ need slowing down. I say long, because they’re long, not tall. The longest being 22cm, and this means I need to do something to help stop these getting too straggly. These Sweet Peas need ‘pinching out’. 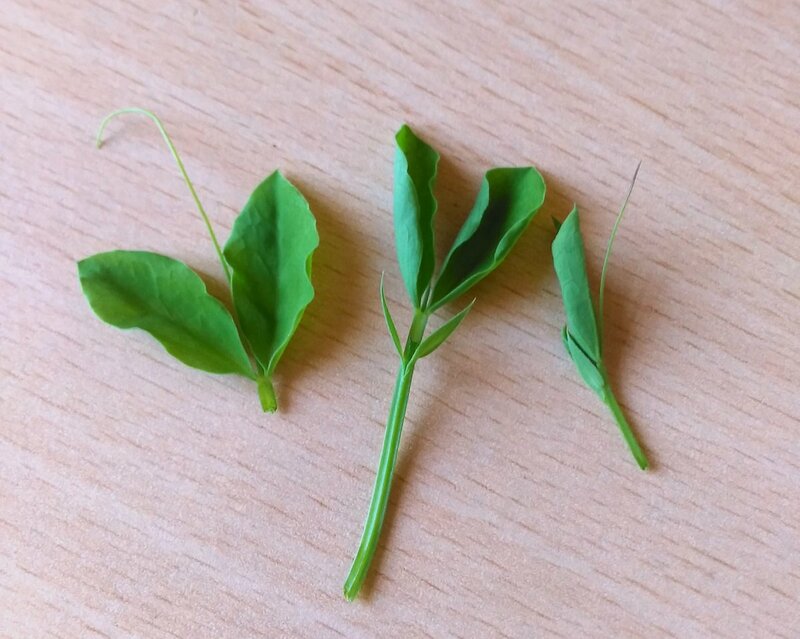 When a Sweet Pea hits on something good, it goes up and up and up, or would do if these were planted against some wire, or sticks, but as they’re still too little to go outside, I need to stop them getting too straggly. By ‘pinching out’ the top growth buds, it will encourage the plant to throw out side shoots, therefore making a stronger, bushier plant. Some of the ‘pinched out’ Sweet Pea ‘Royal Mixed’ growth tips. This will slow them down a bit, result in stronger plants, and also encourage more stems. More stems means more buds, and then more flowers. This is a fairly common practice, and one that I’ve done in previous years. However, if you’re new to this, or new to growing Sweet Peas, then check out this handy little guide from Thompson and Morgan. 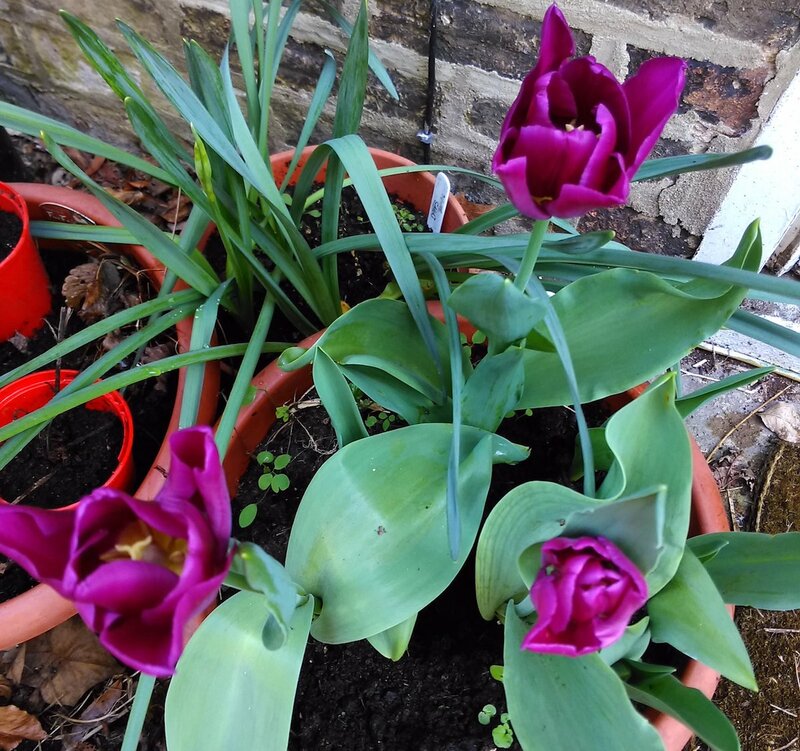 Elsewhere in the garden, the Tulips continue to bloom in a range of lilacs, peach, and now red and deep purple – with my Tulip ‘Triumph’ bulbs blooming for the first time – after I set them on 20th December last year. The dark crimson Tulip ‘Triump’ flowers are almost open. The windowsills are still creaking with pots and trays, but we’re now back down to one propagator only. It’s lovely and sunny this weekend, and as I type this I can hear the birds singing (and rowing under my eaves), and someone is mowing their lawn somewhere down the road. As ever, happy gardening, and thanks for reading.